To Cite: Ghanbarzadeh M, Taheri A, Heyat F. Molecular Structure and Response of the Brain-Derived Neurotropic Factor (BDNF) to Exercise, Ann Mil Health Sci Res. 2016 ; 14(4):e59774. doi: 10.5812/amh.59774. Context: Neurotrophins have been recognized as the main trophic factors in the nervous system. They are a broad family of polypeptide growth factors and the main factors responsible for the modulation of synaptic development. They share a common basic structure but in certain areas which connect to their specific receptors. Methods: This is a review of the literature over the past two decades through keyword searches of brain-derived neurotropic, physical activity, and the hippocampus in databases. Results: Thus, they execute different actions triggering survival or apoptosis pathways. It has been reported that brain considerably responds to exercise, which results in significant changes in anatomical, molecular, and cellular level of the body. Findings suggest that exercise and activity help maintain cognitive function and brain structure, especially due to aging. Brain plasticity that is controlled by BDNF can be the basis of the beneficial effects of exercise on the brain health. Conclusion: In Addition, exercise improves the survival of neurons and increases resistance to pathogenic diseases. This review examines different molecular effects of BDNF as well as the effect of different exercises on the expression of this factor. 3. Regulated other neurotransmitters in maintaining neuronal survival, neuronal differentiation of the developing brain, dendritic branches, and brain synapses of adults (3, 4). Ferris et al. examined the influence of acute exercise on BDNF in 11 males and 4 females. Both groups rode on ergometer for 30 minutes daily and one group rode 20% under ventilatory threshold and another 10% above ventilatory threshold. The levels of BDNF caused a significant increase in the activity of the 10% above ventilatory threshold, whereas the increase was not significant in the 20% under ventilatory threshold (5). Wu et al. and Vsdi et al. reported that omega-3 supplementation alone cannot result in a significant change in hippocampal BDNF levels, while it has a synergistic effect on hippocampal BDNF levels during combining with endurance exercise. Studies have shown that aerobic exercise can increase the levels of hippocampal BDNF and TrkB (6-8). A bulk of studies have been conducted on the effect of anaerobic exercises on the levels of BDNF; for example, Suijo et al. examined the effect of 14 days endurance exercise on running wheel on CREB and BDNF plasticity-dependent factors in the hippocampus of mice, and the results showed that 14 days exercise indicated a significant increase in the protein and gene levels of this factor (9). Lee et al. also investigated four weeks endurance exercise on the levels of BDNF, CREB, and TrkB in the hippocampus of male Wistar rats and the results revealed that endurance exercise enhanced the three factors (10). Given the different types of exercise (strength and endurance) and different roles of BDNF, in this study, the researchers sought to study the molecular effects of exercise on the expression of BDNF and the influence of various types of exercise on the expression of these factors. Secreted polypeptide neurotrophins family include nerve growth factor, brain-derived neurotrophic factor, neurotrophin-3, and neurotrophin-4 (11-13). Other neurotrophins including NT-6 and NT-7 which do not probably exist in mammals have also been detected (14). Brain-derived neurotrophic factor (BDNF) is a secreted protein with a molecular weight of 27.8 kDa which contains 247 amino acids (15-17). 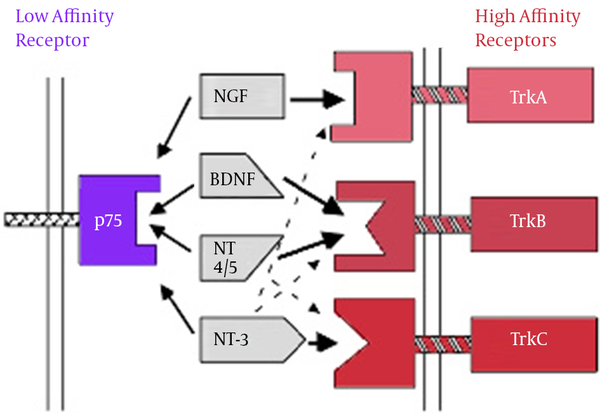 BDNF mediates various actions including neural survival, neurogenesis, apoptosis, axon growth, dendrites, and synaptic continuity and plasticity. In addition to the central nervous system, BDNF is also synthesized in other areas such as immune cells, vascular endothelium and platelets (15). Given that BDNF is able to pass from blood-brain barrier in both directions, it is assumed that BDNF in the peripheral blood flow is transferred into the brain and is involved in neuronal plasticity. In addition, given the overexpression of BDNF in some areas of the brain and bidirectional transfer from blood-brain barrier, BDNF can be a reflection of its changes in the brain (18). BDNF imposes its roles such as neuronal differentiation, synaptic plasticity, processes of apoptosis, and other processes through two types of protein receptor with high affinity to Trk and protein receptor with low affinity to p75NTR on cellular surface (19). BDNF and NT4, 5 act via TrkB receptor. NGF and TrkA receptor TrkC NT3 are connected to the receptor (20). Neurotrophins’ binding to specific receptors causes each to have its own activity (21). Neurons in the central system mostly secret BDNF in the form of ProBDNF (BDNF precursor). If the BDNF receptor is bound to TrkB, it results in the survival of neurons, differentiation, and synaptic activity; however, if it is bound to P75 receptor, it results in apoptosis (22, 23). Binding to Trk receptors results in the dimerization and phosphorylation of Trk receptors and the activation of such receptors; the activated receptors cause a cascade of the number of signals such as MAPK, PI3K, Rap-MAPK, Shc-Ras-MAPK, and PLC-Y. These signals activate transcription factors which change the gene expression by passing through the core (24, 25). BDNF binding to TrkB receptor and the phosphorylation of the receptor as well as the activation of NMDA receptors set three intracellular cascade signals. PLC-Y pathway leading to the activation of protein kinase C, PI3K pathway activating serine-threonine kinase AKT, and MAPK or ERK pathway activating several downstream effectors are quick synapses and ion channels for the release of intracellular calcium depending on the release of intracellular calcium pathway while the lasting and longer effects rely on the other two pathways. BDNF can, also, directly activate the channels to speed up depolarization and target neurons. Through the activation of AKT, PI3K leads to cell survival, MAPK / ERK pathway causes the growth and differentiation of cell and PLC-Y activates IP3 receptor for the release of calcium from the intracellular resources and, also, results in the activation of calmodulin kinase and these three pathways lead the copy of CREB factor (target neurotrophin gene) and thus, BDNF gene expression is increased (26). The rates of BDNF affect synaptic plasticity and subsequently phosphorylation and molecular synthesis occur by regulating the transmission and synaptic function such as Synapsin 1 (phosphoprotein nerve endings that are involved in the release of neurotransmitter, Exxon elongation, and the maintenance of synaptic bindings) and CREB (Cyclic Amp response element binding protein kinase) transcription factor in learning and memory and important gene expression modulators (27). Another receptor responsive to neurotrophins such as BDNF is P 75 which is the family member of tumor necrosis factor receptor (TNFR); however, there are also differences. In addition to the nervous system, it plays a role in cardiovascular safety systems (29). The interior P75 receptor has two spiral sections composed of three parts so that the second part has a binding part in Ne-Terminal between membrane of P75 and this part probably plays an important role in signal transmission (30). The inner part or cytoplasmic part of p75 has no enzymatic property which is considered as one of its differences with tyrosine kinase receptors and thus, as a receptor of neurotrophins Trk. For this reason, neurotrophins Trk receptor has higher and more specific binding power than p75 in binding to neurotrophins (31, 32). 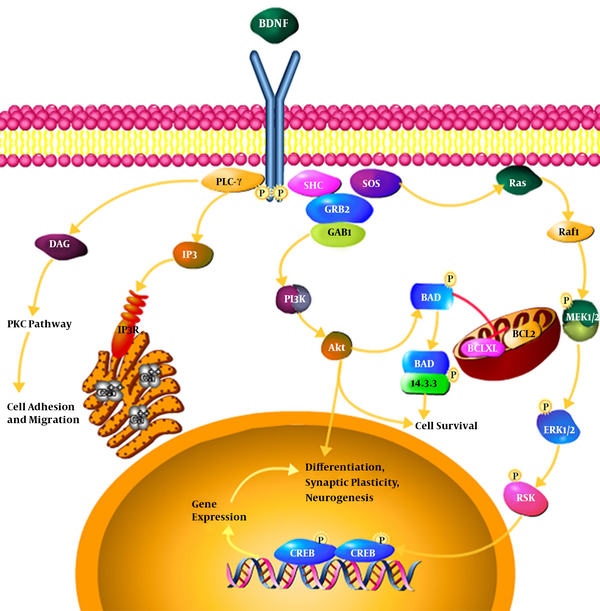 Since p75 acts as a coreceptor for Trk receptor in signaling pathway, it is believed that neurotrophins can induce apoptosis by independently binding p75 to expression Trk. This idea was reinforced when apoptosis happened in the variety of cell ranks which do not express Trk or in which receptor Trk has virtually been eliminated (33, 34). In neurons placed in the apoptotic pathway, central nervous system expresses high levels of BDNF for example due to the peripheral nerve transection. Due to the increase, the expression of Trk receptors is decreased and receptor p75 is increased and as a result, BDNF binding to P75 is increased. So, in these conditions, BDNF causes the activation of apoptosis pathway rather than the survival of neurons (35). In the brains of adult mice, BDNF is expressed in hippocampus, septum, hypothalamus, cortex, and brainstem (36). The distribution of BDNF has been reported in the different brain regions and at a high level in hippocampus as the main hub of memory formation and learning (37). Of all brain neurotrophins binding BDNF to its specific receptor, tyrosine kinase B with a high affinity for binding to BDNF, only signaling system is hippocampus to showing common signaling pathways in different areas (38). Hippocampal has three layers of pyramidal, molecular, and polymorphic cells, Cell bodies of pyramidal cells are in the pyramidal cell layer and apical dendrites of pyramidal cells in the molecular layer. Polymorphic cell layer contains interface neurons. Information enters into seed gyrus of the drug and then into the hippocampus from cortical and subcortical structures through entorhinal cortex in PP pass way. Inputs of hippocampal formation are simulated and use glutamate to convey information (39, 40). Higher levels of BDNF is associated with the better performance of memory and an increase in the volume of the hippocampus. It is thought that BDNF cause cell proliferation in the hippocampus gyrus and, ultimately, increase the volume of the grain (41). Also, studies showed that learning and memory impairment in rats caused by dental bulb pain was associated with decreased expression of BDNF gene and BDNF protein expression and the activation of apoptotic pathways in the hippocampus (42). This is a review of the literature over the past two decades through keyword searches of brain-derived neurotropic, physical activity, and the hippocampus in databases Pubmed, Medline, Irandoc, Sid, Google scholar and Magiran obtained, adjusting and summing. Sports and particularly endurance sports have well-known beneficial effects on brain health and cognitive function (43). 3. Regulated other neurotransmitters in maintaining neuronal survival, neuronal differentiation of the developing brain, dendritic branches, and brain synapses of adults (2, 4). In recent years, specialists have centered their attention on the impact of exercise on brain function, especially its impact on neurotrophins. They are a group of polypeptide growth factors involved in growth, survival, and function of central and peripheral nervous system. These neurotrophic factors have unique applications on the target neurons and other cell types in the nervous system. They can be secreted from target tissues and prevent the death of communication neurons, hence leading to the survival of neurons (2). Among these neurotrophines is the brain-derived nerve growth factor. In general, this neurotrophic factor is found in brain and neurons and has an important role in neuroprotection and neurogenesis (44). BDNF plays an important role in the synaptic plasticity. On the other hand, hippocampus affect learning, memory, and cognitive functions (45). Exercise can affect other genes in synaptic traffic such as Synapsyn 1, Synaptotagmin, and Syntoksyn in order to control the release of neurotransmitters (46). It seems that forced exercise on a treadmill or optional exercise on wheel drive are factors influencing the expression of BDNF and that it cannot be said that one kind is preferred over the other kind. The drive wheel running exercise is in line with less intensity on the animals compared to exercise on a treadmill. On the other hand, treadmill exercise time and intensity can be controlled compared to drive wheels (47). Another factor affecting BDNF levels is training intensity which is determined by the speed of the treadmill and the level of VO2MAX. Soya et al. examined the effect of two different intensities of exercise on BDNF levels and concluded that low-intensity activity significantly increased BDNF levels and this increase in rats with low-intensity exercise was more than in rats with high-intensity exercise (48). Ferris et al. examined the influence of acute physical exercise on BDNF in 11 men and 4 women. Both groups rode on the ergometer for 30 minutes daily, one group 20% under ventilatory threshold and another 10% above the ventilatory threshold. The levels of activity in the above 10% ventilatory threshold increased significantly but the increase was not significant in the 20% below the ventilatory threshold (5). Zuladz et al. measured the effect of 5 weeks of moderate intensity aerobic exercise on the amounts of BDNF. They reported that exercise significantly increased baseline levels of BDNF and the amounts increased after exercise in healthy young subjects (49). Seifert et al. reported that 3 months of endurance training in young healthy adults increased the brain BDNF release (17). In the study conducted by Mirzaee et al, 30 minutes of moderate-intensity endurance training had no significant effect on blood BDNF levels, but 60 minutes of exercise at the same intensity significantly increased the levels of this protein (50). Wu et al. and Vesdi et al. reported that omega-3 supplementation alone could not cause significant hippocampal BDNF levels, but when it was combined with endurance exercise, it had synergistic effects on hippocampal BDNF levels (51, 52). Resistance training is a form of exercise that increases muscle mass and strength by repeated and regular exercises with weights or fitness devices. This type of exercise is one of the most recommended trainings which is considered the primary intervention in sarcopenia of improved physical performance and prevention of functional limitations and muscle weakness in the elderly (53). Previous studies have proven that aerobic exercise can increase levels of BDNF and TrkB (6-8). Among the studies that have been done, Suijo et al. examined the effects of 14 days of resistance training on the wheel on related factors in the form of BDNF and CREB in the hippocampus of rats. The results of their study showed that 14 days of training significantly increase the protein and gene of the factor (9). Lee et al. also examined four weeks of resistance training on the amounts of BDNF, CREB, and TrkB in the hippocampus of male Wistar rats. The results showed that resistance training increases these three factors (10) .Yarrow et al. also reported the increase in serum BDNF levels after resistance exercise (54). Research has shown that such exercise activities cause changes in the structure and function of the neuromuscular junction (NMJ) in the way that physical activity increases the size of the motor nerve terminal branches in NMJ in all areas of pre-and post-synaptic and the amount of released acetylcholine (55). It has, also, been shown that physical activity leads to hypertrophy of nerve endings and increase the release of neurotransmitters in animal models. The exercise-induced changes in NMJ leads to an increase in the expression of secreted factors in skeletal muscles and the central nervous system (CNS) and peripheral nervous system (PNS) (56). Physical activity leads to the increased expression of M RNA BDNF in CNS and PNS. Thus, it appears that the reason for an increase in the expression of BDNF is due to exercise activity and changes in neurotrophines in motor neurons which is one of the factors that increase the BDNF immediately after resistance exercise (57, 58). On the other hand, molecular cell studies have shown that exercise increases the activity of certain signaling pathways such as (PERK, PAKT, PcamKII) and increases the levels of proteins such as Syanpsy marker, Synapsyn I, and GAP-43 growth proteins (59, 60). These increase the concentration and activity of Tpa24 which would ultimately increase the amount of BDNF and increase its binding to TrkB receptors (61). The findings support the assumption that resistance training is beneficial for promoting plasticity of BDNF signaling-dependent hipppocampus since by BDNF binding to specific receptor, in the hippocampus TrKB is the major signaling pathway of the process of synoptic plasticity in hippocampus. In fact three signaling pathways are activated following BDNF and TrkB binding i.e., the MAP kinase, phosphatidylinositol-inositol 3 kinase (PI3K), and the phospholipase C gamma (PLC-Y). All three of these pathways are activated after the binding of ligand to the receptor and finally result in the proliferation, differentiation, and survival of neurons. Meanwhile, the third route can have more significance because of the conflict between the PKC and calcium factors as exercise plays an important role in calcium homeostasis. PLC-Y activation leads to the activation of IP3 -dependent signal and diacylglycerol (DAG). IP3 leads to the rapid release of calcium from intracellular stores and activates DAG and PKC leading to hypersensitivity of contractile apparatus and the release of calcium, followed by intracellular events such as proliferation and migration in the muscles, but what is important in neuronal cells, is the same IP3 path that in addition to proliferation, differentiation, and survival of neuronal cells, particularly in the hippocampus, leads to long-term memory as well as increased synaptic transmission (62). In summary, due to the effect of physical activity, most growth factors, notably BDNF, increase. Exercise stimulates neurogenesis, increases resistance to brain damages, improves learning and cognitive function, and prevents atrophy caused by aging. In line with physical activity, the highest increase in BDNF mRNA expression can be seen in hippocampus and cortex (63). In addition to BDNF, exercise causes the expression of some other genes and support synaptic plasticity. Interestingly, the expression of some genes associated with plasticity, such as COX2 and NARP can be due to BDNF. BDNF synthesis is controlled by central neurotransmitter and peripheral neuroendocrine systems. An increase in synaptic plasticity due to BDNF increase and other genes in exercise results in an increase in the speed of learning in animals and humans. In general, physical activity is an important factor affecting the increase in health and improves cognitive function in mice and humans, especially in the elderly. Exercise, also, helps prevent the development of depression in animal models. BDNF takes a longer time to effect the changes. In total, the findings of various research showed that exercise training can lead to improved cognitive performance; however, in response to what activity is more effective, there was no significant difference between resistance and endurance activities. In resistance exercise, it is likely that protocols with longer time frames are required for the changes in BDNF. Therefore, data from animal models suggest that exercise provides beneficial effects on brain function; however, human studies are in the early stages and require further research (64, 65). In addition, due to the neurotrophins’ connection with their molecules, it is difficult for them to selectively reach their target tissue in CNS because the molecules corresponding to each area have limited release and cannot pass the blood-brain barrier. Accordingly, future research should focus on indirect pass ways such as the use of neurotrophin secreting factors or the use of small molecules that stimulate the expression of BDNF and their receptors (66). This study is extracted from a class-research study on the cellular and molecular principles of sport physiology in a PhD course in nerve and muscle field which has been done in partnership with the PhD students named Asma Taheri and Fatemeh Heyat in the department of sport physiology, faculty of sport Sciences, Shahid Chamran University of Ahvaz, Iran, 2015.